Kitty and Romy. Photo by Jordan Holt. Directors Bel Powley and Alice Felgate caught up with Constellation about their new film over email. (AF): I wrote the script because I wanted to make an honest film about mental health. I wanted to show how monotonous depression and bipolar disorder can be. I wanted to capture the everyday struggle that people with mental health issues face. The nuances, the triumphs, the failures, which can often be life and death. The day I finished the script, I sent it to Bel. Straight away she wanted to make this film with me, together. It's a subject matter that’s very close to both of us. 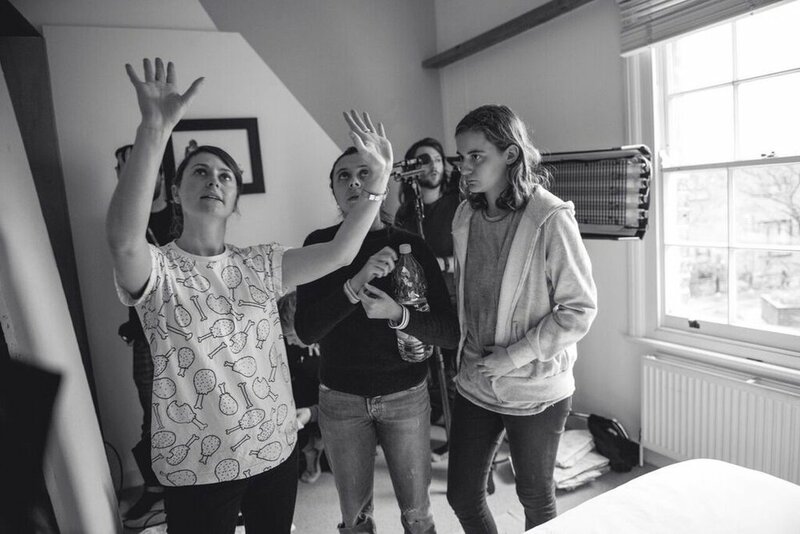 Bel Powley and her team behind the scenes. Photo by Tegan Williams. (AF): Bel has been fortunate to work with the brilliant Marielle Heller and Haifaa al-Mansour, and she's said what a different and wonderful experience it is being led by a female director. We can only hope that like Marielle and Haifaa, who have given us the confidence to go for it and direct, we show the young girls out there to be brave and do it for themselves! This film focuses on the reality of depression on a day-to-day basis. That's why we made it, to show that side of the illness. I think we do see men on screen struggling with depression—I've seen beautiful performances—but it’s still not enough. Suicide is the biggest killer of men in the UK under 45. I want to see both men and women on screen depicting mental illness; the more light we shed, the better. Our mothers. For being strong, intelligent, passionate woman who taught us to be confident and who always support us with truth and love. I would say if you have an idea that you believe in, nurture it, protect it, fight for it, and seek advice on it. Work as hard as you can to make your film, and find the balance between not compromising your vision and being open to suggestions and guidance. Earlier this year, I had the pleasure of working with Bel on Ashes in the Snow, which my boss, Chris Coen, was a producer on. Bel and I got along from the getgo and shared many of the same opinions— especially having worked in the film industry from a young age. She asked if perhaps I’d like to be involved with Little Hard as a producer, after reading the beautifully honest words of Alice Felgate; myanswer was 100% a yes. The most amazing aspect about working on Little Hard was the research that went into finding a predominately female crew. The truth is, there are a lot of females working in this industry—behind and in front of the camera—who don’t always get a lot of recognition. We were able to uncover so much talent throughout making this film. I’ve been working with Chris Coen as his assistant for over a year; we’re developing about eight scripts, which are all at different stages of the development process. We have three feature films going into production next year, so I’ll be on set for most of 2017—while curating new teams and reading a lot of scripts! I was introduced to the ladies via Caviar Content (who have partly funded the project). After I read the script and met with the team, I knew it was a story I wanted to be involved in developing and sharing. The film approaches depression in a different way to what we are used to seeing. When depression is portrayed onscreen, it is often expressed through a dramatic performance. There are millions of people living with depression day to day who don’t recognize their illness, and neither do those around them, but every day is a struggle; that is what the film shows us. Take chances, ask questions, and be open to feedback. It is the only way to learn what works for you and what doesn’t.